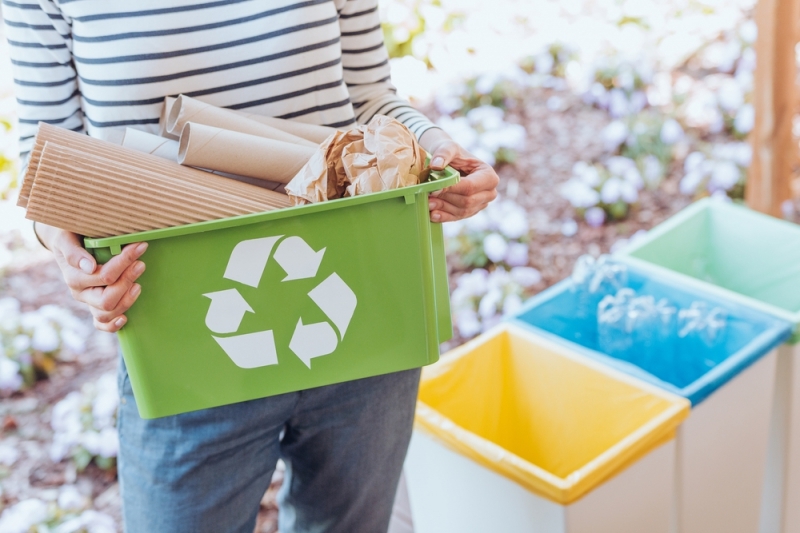 The participants and associated partners of ITMO University were invited to join the open webinar on April 4th, devoted to implementation of the EduEnvi project and development of cooperation with industry in the field of waste management. See here the material of the Open Webinar organized on 4th April, 2019. 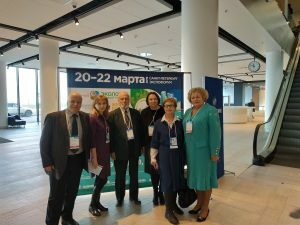 Have being already traditional the annual ECO-FORUM – 2019 «The Ecology of the Big City” was conducted on March 20-22 in St. Petersburg. Dr. Olga Sergienko, representing the EduEnvi project partner, ITMO University, was invited to make a presentation devoted to the project. The presentation were given at the panel session “Sustainable urban development” and called an interest among the participants. See the project presentation here from Eco Forum. In Russian by Olga Sergienko, ITMO. 27.02.2009 14.00 workshop with further webinar connection at 15.00 between partner universities on the project 585761-EPP 1-2017-1-FI-EPPKA2-CBHE-JP «Enhancing competition in Sustainable Waste Management in Universities of Russia and Kazakhstan» took place in M. Auezov South-Kazakhstan State university with participation of the Ural Federal University named after the First President of Russia B. N. Yeltsin, UrFU, Russia, Al-Farabi Kazakh National University, Sh.Ualikhanov Kokshetau State University, South-Kazakhstan State Pedagogical university, as well as representatives of enterprises. During discussion were noted that in Kazakhstan, as in the world, the problem of safe disposal of production and consumption waste has always been one of the most important environmental problems. Currently, an important task is set-waste disposal – the use of waste as secondary material or energy resources. Kazakhstan has accumulated more than 45 billion tons of production and consumption waste, of which only 5 percent is recycled. With such huge amounts of garbage, waste processing plants do not have enough raw materials for processing, since there is no culture of separate waste collection in the country. According to the statistics Committee, about 500 specialized companies in the field of waste management are registered in Kazakhstan. The largest industry is the “Altyn – TET” complex, which operates in Astana and is engaged in sorting and processing of jointly collected municipal solid waste. Other companies, which works in Kazakhstan are called “KazakhstanWasteRecycling” (paper and cardboard), SAF (glass), Kazkauchuk (tires and rubber waste), WestDala (oily waste, integrated waste management), “Promtehresurs KZ” and “Recycling” (electronic waste). Therefore, the use of scientific and technological progress for the introduction of environmentally friendly technologies is of paramount importance for the sustainable development of the economy. In Kazakhstan, manufacturers of environmentally friendly products are planning to issue special certificates within the framework of the Concept for the transition to a “green” economy. One of the innovations of the document is the concept of “green” purchases, which will stimulate those processing enterprises that produce products, for example, in the construction of roads and bridges. Now a lot of different thermal insulation materials, there are a lot of materials that are used in finishing works. – reduction of taxes of enterprises engaged in waste processing. 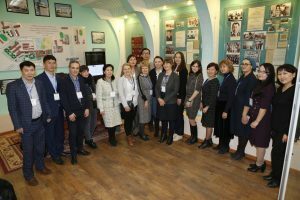 27.02.2019 y. the seminar on the theme: “Development and modernization of the curriculum, quality assurance of the educational process” took place in the Sh. Ualikhanov Kokshetau State University. During the workshop were noted that establishment of an effective regional and local waste management system is not possible without qualified and trained personnel in this area. 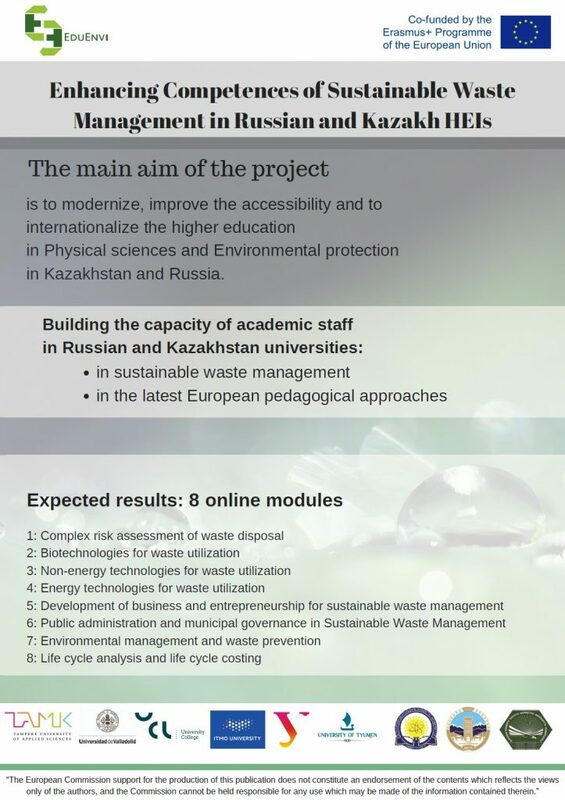 Since 2018, the international project: «Enhancing Competences of Sustainable Waste Management in Russian and Kazakh HEIs / EduEnvi. 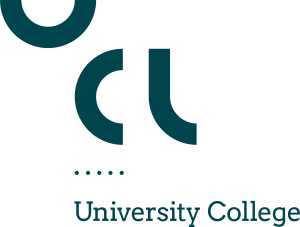 The project coordinator is Tampere University of Applied Sciences, Finland (Tampere University of Applied Sciences – TAMK). The project is implemented under the Erasmus + programme funded by the European Commission. Within the seminar, associate professor of Sh. Ualikhanov Kokshetau State University Kurmanbayeva Aigul and manager of LLP “LS Kokshetau” Sergey Beznosikov gave reports. The main environmental problems of the region in the field of waste management were considered. As a result of the discussion, the following resolution was adopted. Development and implementation of new electronic educational programs in the field of waste processing in the higher education system will improve the skills of specialists and improve waste management. Prepared modules are practice-oriented and increase the competence of future specialists in the field of waste management. The training program should include practical training in office management in the field of waste management. Development of project documentation, protocols, acts and other documents. The Union of workers in the waste management industry with production workers, environmentalists and University teachers is necessary to solve the urgent problems of the region related to waste. Teach students to work with the population. To carry out propaganda and explanatory work among the population and activities for environmental education and upbringing. To involve the collection and disposal of garbage for all residents, through the preparation of propaganda leaflets, promotional videos, banners, etc to use for this social network. – issuing low-interest loans, grants, compensations and subsidies to waste processors for the purchase of modern equipment or modernization of existing technologies. Sustainable waste management is an extremely important task of the state environmental policy. Currently, the industry of collection and processing of secondary raw materials in our country is only being formed and requires support from both, the state and the population. 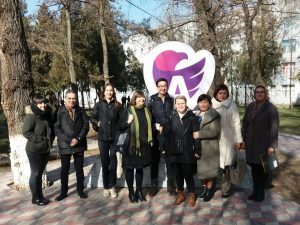 One year of active working in EduEnvi is behind now and in the end of January EduEnvi project group met in the Mid-Project Meeting in Shymkent, Kazakhstan. 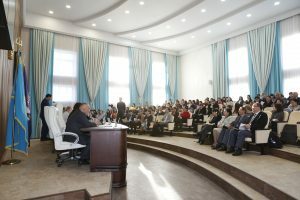 Auezov South Kazakhstan University hosted a meeting including sessions related to Curriculum Content Planning. The modules that the group concentrated this time relate to comprehensive risk assessment in waste management, biotechnologies for waste utilization, Non-energy technologies to waste utilization and life cycle assessment and life cycle costing. 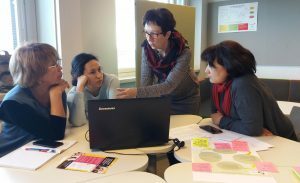 The courses were jointly developed as used to in EduEnvi project: the teachers responsible of the courses presented the course plans and workshop participants were able to comment and give feedback from the content and the pedagogical point of view. Also practical classes were carried out as demonstration. This way the teachers are able to test how the chosen pedagogical methods work in real life. As the midterm of the project is coming closer, it was also valuable to have a week devoted for group work and checking the status of the project: “Where are we now”. In the workshop sessions themes such as Sustainblity of the project and Dissemination were discussed very practically. 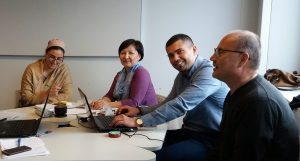 To help the project implementation the National Erasmus officers from Kazakhstan and Russia have conducted advisory monitorings in the last few months. After these advisory monitorings the Erasmus officers gave practical recommendations for the project implementation. The EduEnvi project group found these recommendations very productive and helpful for the continuation of the project. 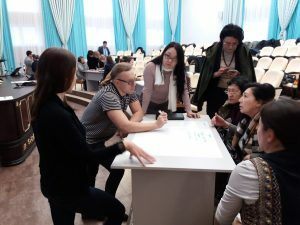 During the meeting in Shymkent the project managers representing all the partner organizations gathered into a circle and deeply discussed these recommendations and made concrete plans on how to improve the project implementation. All in all, the week in Shymkent was efficient and productive for EduEnvi. Though the project team has been working hard past few months developing the 8 online modules, everyone sees that the coming period is crucial on how the project succeeds. Sprint in the module development is needed. Refining all the online courses and preparing the piloting stage challenges all the project partners. However, the atmosphere is good and common goal is clear for all: Improving the education on Sustainable Waste Management for making better future. Project group visiting the university museum. Project partners from Spain, Finland and Kazakhstan. 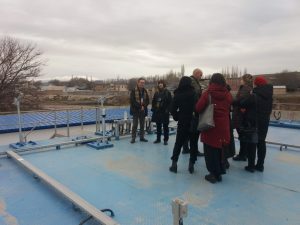 Excursion to wastewater plants in Togus. A part of EduEnvi project is to build the capacity of university teachers from Russia and Kazakhstan in e-learning pedagogies and tools. 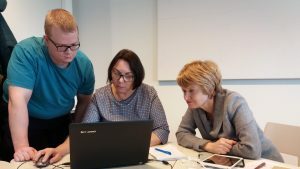 The project coordinator, TAMK, organized a hands-on workshop for creating online modules on 1-12 Oct, 2018 in Tampere, Finland. All together 13 workshop participants represented different areas such as biotechnology, business, economics, physics, waste management and tourism and came from six different universities. Jarmo Vihmalaakso from TAMK Floworks showed in the workshop how to make the course structure development and how to build an online course. One of the models used in TAMK is the five stage model –framework of Professor Gilly Salmon to build the online course. 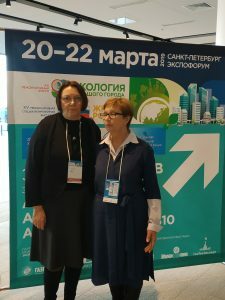 In the interview of Ms Irina Sergeeva, Dr of Economics and Professor of the Faculty of Technological Management and Innovations in ITMO University and Ms Olga Sergienko, PhD and Assosiate Professor of the Faculty of Food Biotechnologies and Engineering in ITMO University was found that there is a huge need for the curriculum change and curriculum development work. The complete and comprehensive curriculum in sustainable waste management is missing in Russia and Kazakhstan totally. There are courses and pieces of studies somewhere, but the comprehensive curriculum is still needed. Also the knowledge and use of e-learning is requiring some further development, that is why this project is so important to Russian and Kazakh university partners. Especially the need is for a Master level online course. The ITMO University wants to make these online courses flexible and free choice courses, which are then available for hundreds of students. This is a unique pilot in Russia. “If we succeed in this course, then later we hope for the government funding. Russia needs more information and skilled specialists on waste management and environmental issues. In this course it is important to take into consideration also the economic view and the business process. This project wants to promote also entrepreneurship in the area. This cooperation includes also companies in Russia and we need to get the feedback from Russian companies as well. Companies represent environmental business such as waste plants. We need to update the skills and knowledge in environmental issues and waste management urgently in Russia. Please follow us in Facebook, Twitter and LinkedIn!